"This recipe comes with no grains, gluten, poultry by-product meal, chicken, or filler ingredients. " "This dog food is very nutrient-dense, and it contains up to a 30-percent protein content that helps to support strong and healthy muscle growth." "The slices of meat and vegetables are soft enough that you can cut them into smaller portions for your smaller breed to eat without a problem." "The meat trio formula comes supported by non-GMO fruits and vegetables for a healthier formula that's easier on your dog's system." "It comes with a tailored blend of fiber and protein that help to support healthy weight loss and weight maintenance." Rachel Ray's natural dog food comes in nine different sizes ranging from a small 3.5-pound bag up to a larger 23-pound bag. Several of the recipes don't contain chicken, and the protein sources are salmon, turkey, and beef with a sweet potato carbohydrate. The protein source comes listed on the bag as the first ingredient, and this comes followed by a fish meal, sweet potatoes, beet pulp, peas, tapioca, and whole flaxseeds to give your dog a balanced diet. This recipe comes with no grains, gluten, poultry by-product meal, chicken, or filler ingredients. This natural dog food comes formulated with vitamins, minerals, healthy and filling carbohydrates, and no artificial colors, artificial preservatives, or artificial flavoring. The salmon is an excellent source of fatty acids and lean protein that help to support your dog's growth, development, and maintenance throughout their lives. 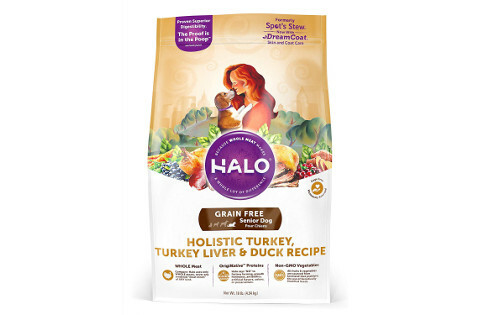 Dog parents who bought this chicken-free brand liked that it had a lean protein source combined with a more healthy carbohydrate source for complete nutrition. Dog parents who bought this food did say that the kibble may be too large and too hard for smaller dogs to comfortably eat. This dog food by Purina costs just under two dollars per pound, and you can pick from five different sizes ranging from 3 pounds up to 25 pounds. The grain-free formula has real beef listed as the first ingredient on the package. This dog food is very nutrient-dense, and it contains up to a 30-percent protein content that helps to support strong and healthy muscle growth throughout your dog's life. There is no corn, wheat, soy, or artificial flavoring and colors in this food, and this means that it's a healthier formula. It comes with sweet potatoes for carbohydrates, and your dog will also enjoy peas, dried beet pulp, liver flavoring, and a host of vitamins that help to support your dog's immune system, brain development, skin, and coat. You'll get a slightly smaller kibble size that is great for a variety of dog breeds. Pet owners who bought this food for their dogs were happy that it contained no chicken, wheat, corn, or soy for a healthier formula that was better for their dog. Pet owners did say that this brand can cause mild digestive upset in the first few weeks of feeding it to their dogs. This wet food comes in two styles, 11 different flavor combinations including lamb, turkey, or beef, and two different sizes that allows you to pick the best food for you dog. Your dog will get 23 essential vitamins and minerals at every meal for healthy growth. This wet food comes optimally formulated with a protein to fat ratio that helps ensure that your dog has ideal body condition throughout their lives. The fatty acid content is balanced, and it helps to support your dog's skin and healthy coat. The slices of meat and vegetables are soft enough that you can cut them into smaller portions for your smaller breed to eat without a problem. It has a slightly lower protein content than some of the dry foods we reviewed on this list, but it has enough for routine maintenance. People who purchased this wet dog food for their pets liked that it came in several different sizes, flavors, and styles because they could mix and match to keep their dog interested. People who purchased this wet dog food didn't like that the wet food had a stronger smell that lingered when they opened the cans. This senior dog food comes formulated with whole turkey, duck, and turkey liver without any meat meal, fish meal, or chicken meal for a healthier formula. You can pick from two different bag sizes, and this is great if you're giving it to your dog for the first time. This food comes formulated for superior digestibility with more bioavailable nutrients to help support your senior dog's entire system as they continue to age. The meat trio formula comes supported by non-GMO fruits and vegetables for a healthier formula that's easier on your dog's system. This food has a life stage formula that has a lower calorie content, quality protein, and higher fiber to ensure that your senior dog maintains a healthy weight and digestive system. There is no factory farming involved in making this food, and it's also sourced from trusted sources. Senior dog parents who bought this food were pleased that it has three different proteins and non-GMO vegetables and fruits. Senior dog parents did point out that this food is very expensive for what you get when you order it. 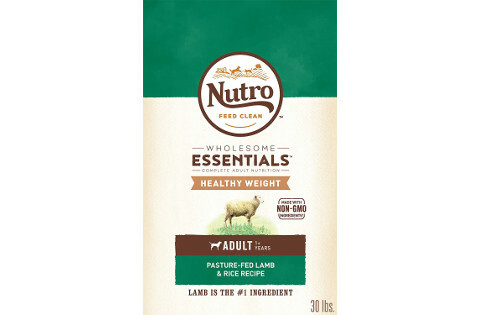 This food has pasture-fed lamb listed as the first ingredient for a quality and lean protein source. It comes with a tailored blend of fiber and protein that help to support healthy weight loss and weight maintenance. Your dog will also enjoy an exclusive blend of vitamin E and antioxidants that help support a healthy immune system, joint health, skin and coat, and healthy growth. There is also no non-GMO ingredients in this food, and this makes it a healthier choice to help your dog lose weight. Lamb, brown rice, and peas are the first few ingredients listed on the bag, and these ingredients help to ensure that your dog gets a healthy and balanced meal each time they eat it. The manufacturer sources all of its products from trusted sources around the United States to ensure quality. 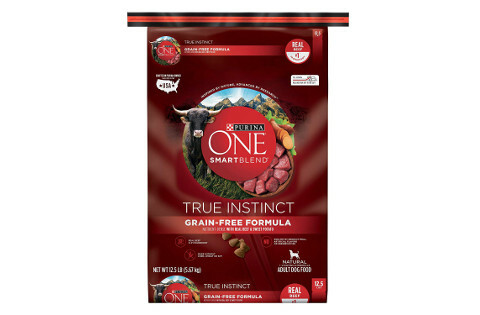 People who bought this brand for their dog to help them lose weight liked that it came with an exclusive blend of fiber and protein to support healthy weight loss. People who purchased this dry food did mention that it could cause coat problems like making it dry and brittle. Although chicken is an extremely popular product in a lot of brands of dog food, it can wreak havoc on your dog if they have allergies to it. These allergies can make picking out a dog food that is tasty enough to hold their attention while containing no chicken a difficult and time-consuming task. This is why we took the initiative to round up the best chicken free dog food available and list mini reviews on each product. We're also going to have a short buying guide that gives you great alternate protein sources along with reasons why you may want to consider avoiding chicken in your dog's food. Chicken is extremely popular with all different manufacturers because it contains an excellent ratio of fat to animal protein that helps support the maintenance, repair, and growth of your dog's cells. It's also very nutritious, and it's a lean protein source that that doesn't add a lot of extra fat to your dog's diet. Chicken is also very rich in important vitamins and minerals including vitamin B6, Niacin, and Selenium that help to encourage a healthy digestive tract, proper hormone levels, cognitive development, and a properly functioning metabolism. It also has a palatable flavor profile that can entice picky eaters to routinely eat the same food. Aside from whole chicken, chicken meal and chicken fat are two other popular additives to a lot of dog food brands. Chicken meal may be missing the water content that whole chicken has, but it retains the higher levels of protein and fat. In fact, it has a higher amount of these two things when you compare it gram for gram with a whole chicken. Chicken fat is also an important ingredient in dog food because it provides essential fatty acids that can help give your dog an immune boost, improve their skin health, and repair their coats. This ingredient is usually farther down the list on the nutrient label, so you may have to hunt for it. You could contact your veterinarian because there are tests they can do to help narrow down your dog's allergy triggers. They may also have suggestions on how to help calm any symptoms your dog may have from allergy shots to tablets. You can also switch your dog to a limited ingredient food without any chicken ingredients if you believe this is the cause of their reaction and monitor the results. You may want to slowly start to reintroduce ingredients to rule them out as the root cause of your dog's problems like fruits and vegetables. Salmon or other types of fish are a great source of protein that contains a very high level of essential fatty acids that can help nourish your dog's skin and coat while boosting their immune system. You may also find dog food with Whitefish, Mackerel, Trout, and many more listed on the bag. Dog food manufacturers are starting to add more novelty meat sources into their dog food to introduce more variety, and an advantage is that your dog most likely never had exposure to them. They include things like crocodile, kangaroo, bison, venison, and rabbit. Although there is a lower chance of an allergic reaction with these protein sources, they're typically very expensive because the manufacturers have to source the product from different countries. However, some dog owners claim the price is worth it if it works for their dog. Your mind may go straight to chicken when you think poultry, but it includes things like turkey, duck, pheasant, or even quail. They all tend to contain excellent amounts of the same nutrients you find in chicken like Niacin, vitamin B6, and Selenium. Duck does tend to have a higher fat content though. However, it's important to note that many poultry flavored dog foods also contain small amounts of chicken fat or chicken meal. This may not be enough to set off a full-blown reaction from your dog, but it may make them uncomfortable. If your dog can't have chicken and fish doesn't appeal to them, classic red meat may be more up their flavor profile. Red meat comes from sources like lamb, beef, or pork, and it has a higher animal fat content than your dog would get if they ate the more traditional chicken. Red meat sources also tend to have higher levels of zinc and iron, and these are essential nutrients for your dog to have. Again, you should read the entire label because chicken fat and chicken meal usually make it into dog foods that have red meat as the main protein source. 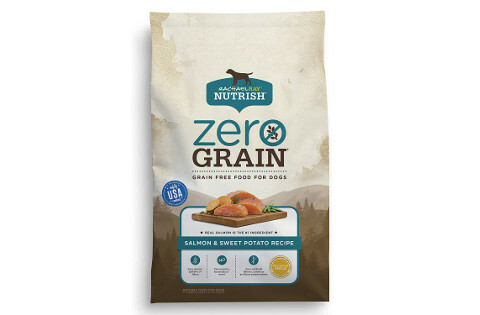 Our pick for the best chicken free dog food out of the products we reviewed was Rachael Ray Nutrish Zero Grain Natural Dry Dog Food because it came formulated with a healthy blend of fruit, vegetables, and a quality protein source. We also chose it because it comes in several different flavors and and sizes that allows us to customize our order. The fatty acid content helps to support our dog's growth, skin, and coat throughout their lives. 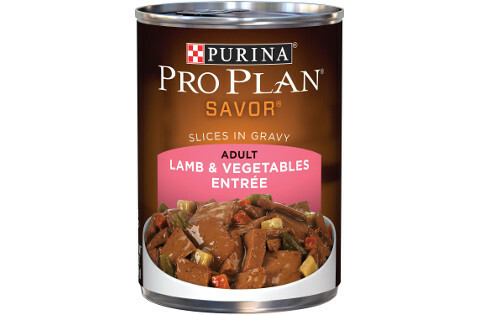 Finally, this dog food uses a lean protein source that is better for your dog's digestive system than other choices. This is why we chose Rachael Ray's Nutrish brand food.